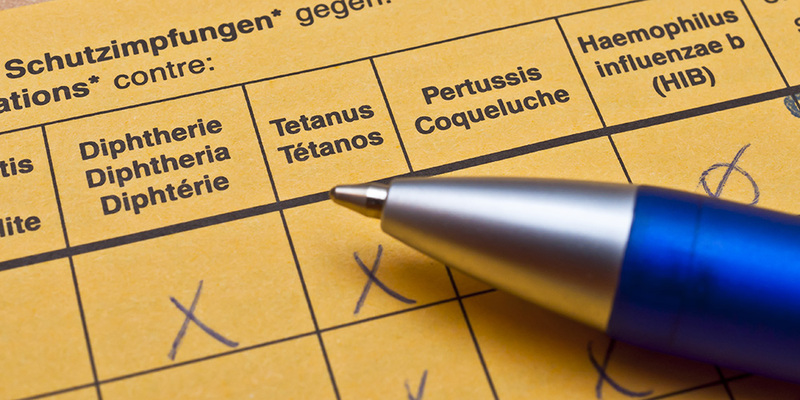 The Tetanus vaccine is an often-overlooked immunization in adulthood. Most people associate immunizations with a part of routine health care in childhood and adolescence; then, it is long forgotten. During the summer months, when we ditch the socks and boots for bare feet and sandals, people can increase the risk of exposure to the bacteria that can cause Tetanus. Tetanus, sometimes called lockjaw, is a rare disease caused by bacteria known as Clostridium tetani. The bacteria that cause Tetanus can be found in soil, manure, or dust. They infect humans by entering the body through cuts or puncture wounds, particularly when the wound area is dirty. Animal bites, burns and non-sterile injection of drugs can also lead to infection with Clostridium tetani. A toxin produced by the bacteria affects the function of the nerves and leads to severe muscle spasms in the abdomen, neck, stomach, and extremities. Lockjaw occurs when the muscle spasms in the face and neck can lead to the inability to open the mouth – this is one of the most common symptoms of tetanus. The first symptoms of Tetanus can appear any time from 3 days to several weeks after infection, but the average time until symptom onset is 8 days. Tetanus is not contagious, so you cannot acquire the disease from someone who has it. It is a serious illness that is fatal in up to 30% of cases. Vaccination is considered to be essentially 100% effective in preventing illness. The Tetanus vaccine is a toxoid, meaning that it protects against the toxin produced by the bacteria. Public Health in Ontario advises that Tetanus immunization be administered to children from infancy to adolescence in their routine schedule, and then every 10 years until death to refresh your immune system’s memory cells. If it has been more than 10 years since you or those you care for received their last Tetanus booster, contact your healthcare practitioner to bring your immunizations up to date. A booster vaccination may also recommended if you have sustained a deep, contaminated wound and more than five years have passed since your last vaccine dose.